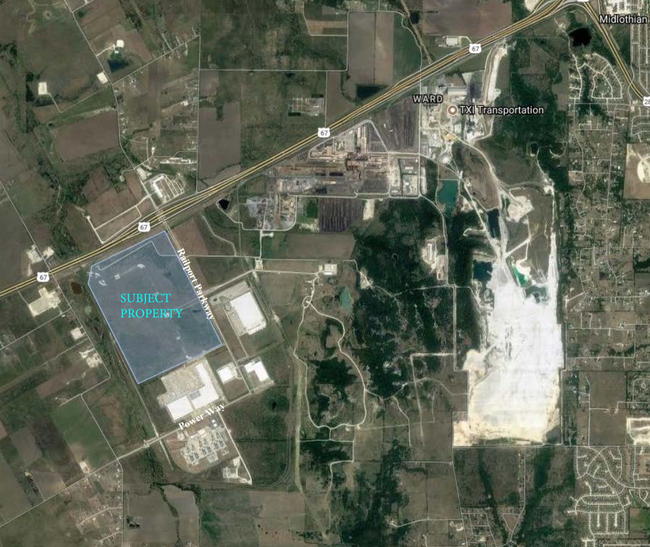 Google purchased 375 acres in the Railport Business Park in May 2017 and in July 2018 received Ellis County approval on a 10 year tax abatement agreement between the county and Google. The land was acquired under the entity Sharka LLC. The Dallas News reportsThe Midlothian city council approved a 100 percent personal property tax abatement and 85 percent improvement tax abatement over a 10-year period for the development of a data center. According to Ellis County documents, the abatement is for 10 years and begins Jan.1 of the year following the City of Midlothian issuing a certificate of occupancy. The abatement agreement also notes Google must invest a minimum of $500 million in its facilities and have a minimum of 40 full-time employees by the end of the fifth year of occupancy. According to council documents, the data center could bring a $500 million capital investment and up to 40 jobs by the fifth year of the abatement period. Midlothian Texas is 25 miles southwest of Dallas. Midlothian is known as the cement capital of Texas. The area has 3 of the 10 largest cement plants in the United States (Ash Grove, Holcim, and Texas Industries.) Midlothian became a prime area for cement quarrying due to the Austin Chalk Escarpment, a unique geological formation that runs north-south through the city. RailPort Business Park is a 1,700-acre rail-served business park development just south of Dallas/Fort Worth in Midlothian, TX. It is centrally located to the Metroplex and the booming Southern Sector industrial market, being 25 miles south of Dallas and 27 miles southeast of Fort Worth. Interesting enough, there are no other data centers within 15 miles of Midlothian. Most of the data center development in the metro is either in Dallas or to the North (Plano, Carrolton, Richardson, and North Fort Worth.) Google is a data center pioneer in the South. From the perspective of electrical supply, it might prove to be a smart decision. As the high growth data center industry clusters to the North, Google has chosen to colocate its data center next to a slow growth, but high electric consumption industry.